The settings page contains all the settings that are pertinent to the module. Here's a description of what each setting means. These settings relate to the overall functioning of the script and provide a few controls over limiting the log size. If database size is an issue, these settings can really come in handy. Automatically track activity for all new forms By default, this setting is enabled ("Yes"). It lets you choose whether or not you want to track activity for forms that you haven't created yet - for forms that you will be adding sometime in the future. If you're only interested in tracking the submission history for a particular form or forms, you should set this field to "no". Limit submission history size to # records This is the first of three settings that let you control the maximum size of your submission history tables. This setting limits the total size for each submission. So if you were to set this to "20 records", the module would only track the last 50 changes to a submission - older changes are dropped. The default value is 50. Limit total table log size to # records This setting lets you ensure that the total size of the history table never exceeds a certain number of rows. This setting is independent of the actual submissions: it will always delete the oldest history rows that exceed the total permissable row count. By default, this setting is set to empty - it doesn't limit the table log size. Auto-delete history older than... This setting provides another alternative way to keep your submission history logs in check. It will automatically delete all history that's older than a particular date - e.g. 1 week, 6 months or a year. This setting is also set to empty by default (i.e. if never deletes old history). Num Deleted Submissions Per Page This settings determines the number of deleted submissions displayed per page on the "Undelete" page for each form. You can find that page by clicking the "UNDELETE" link on the Tracking page for each form. These settings affect the appearance and functionality of the history panel that appears at the bottom of the administrator's Edit Submission page. Submission history section label This is the label that appears to identify the submission history panel on the administrator's Edit Submission page. 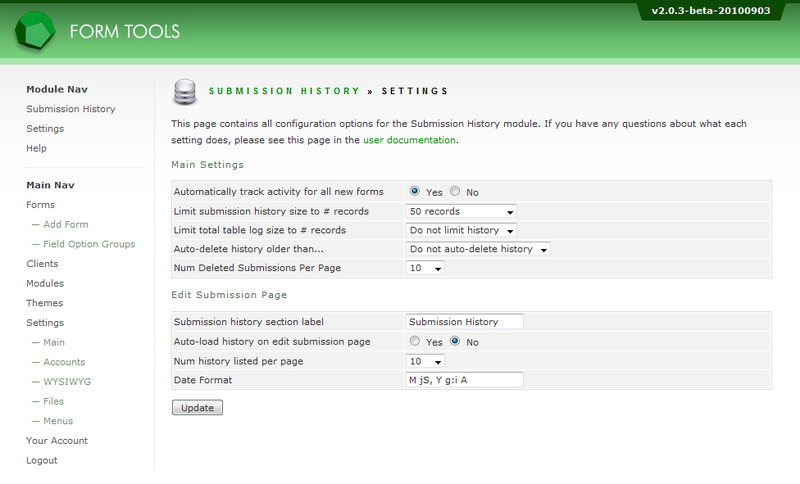 Auto-load history on edit submission page This setting lets you choose whether or not the submission history panel should automatically show the history when you're browsing your submissions. Num history listed per page This determines the number of submission history items to show on the Edit Submission page. By default, it's set to 10. Whenever there is more history to display than can fit on a page, you will see some « 1 2 3 » pagination. Date Format This setting controls the formatting of the dates in the submission history panel. As with all other date format settings in Form Tools, the format is determined by the PHP date function.